Golf isn’t as simple as it seems. There’s plenty of math involved! That means finding your way to the pin, up and down certain slopes, is always going to be tricky when you start. Even now, I have to fine-tune my golfing guesswork! It takes years of practice. Thankfully, there are a few products out there which can help to make things that little bit easier. In this TecTecTec VPRO500 Golf Rangefinder review, I’ll be taking a look at one of the most potent gadgets available for golf aficionados. But how can it help to improve your own game? Are you struggling regularly to hit a strong enough swing to get to the pin? Unsure how to navigate slopes and curves? Don’t worry; I’m right there with you. Only true pros can take to the course and confidently say they know exactly what to do with distances and curves. 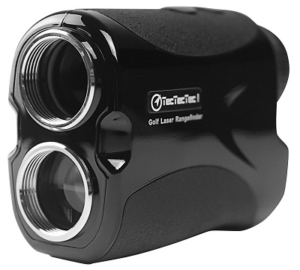 Plenty of people use golfing technology such as rangefinders to help hone their perfect games. After all, getting to the pin in just a few strokes is going to take time and effort. Something like this TecTecTec product should help you refine your own golfing standards. I’ve put together this TecTecTec VPRO500 Golf Rangefinder review to help break this popular model down a little for regular and novice golfers. If anything, the power and accuracy promised should appeal to most players on the links, regardless of experience. The VPRO500 is well-known online for its incredible accuracy. The whole point of a rangefinder is to be able to look through its lenses and be informed how far you have to travel to get to the pin. With this gadget, you’ll get an accuracy of up to 540 yards. It’s also pretty capable when it comes to recording distance through certain obstacles and distractions. We’ve all played on holes where things get in the way. The field of vision is exceptionally crisp and clear, thanks to multilayered optic technology. You also get access to a decent amount of slope technology. That means the rangefinder won’t be put off by dips and curves. Its built-in ‘PinSensor’ will calculate its way to the hole for you even if you’re playing on rough terrain. This type of rangefinder is beneficial for those players just starting to understand distances in golf. For people like me too, who have been golfing for a long time, it’s a fantastic little asset to have to hand if you’re playing on a new course. The scan mode, which in this rangefinder is called ProScan, will also help you to find specific hazards and pitfalls that could severely impact on your score. This feature is also fantastic if you want quick and straightforward course evaluations. It’s surprisingly easy to use. What does sometimes put some golfers off is how usable some of these gadgets actually are. This is perhaps one of the most user-friendly golf accessories on the market, and it’s one of the most affordable if you shop around. However, what it does lack that other models lead with is lock-on technology. This means that, while the gizmo will help you find your way to the pin, it won’t alert you or lock-on. This means there could still be a fair bit of guesswork involved. Your tastes may vary, of course. It’s hardly worth closing this TecTecTec VPRO500 Golf Rangefinder review without summarizing the main points on either side. Are you struggling to get close to the pin in a few shots? Worried about objects and hazards getting in the way? TecTecTec’s VPRO500 will more than assist you in the search for golfing accuracy. However, it’s not just for novices, as it does provide plenty of useful data for pros. If you’ve taken a look at my TecTecTec VPRO500 Golf Rangefinder review and are keen to give the gadget a try, why not take a look online? It’s readily available from Amazon and other retailers, and will likely provide you with plenty of accurate course readings for years to come.